Want us to Cater your Wine and Cheese Event ? Let's make an Unforgettable Event! Wine41 now provides full-service custom catering for events large and small. We offer unique wines and seasonal menus with quality ingredients and a professional staff in partnership with Chef David to make your gathering seamless and memorable. Wine41 offers wine and Champagne glass rental at an affordable price. There is a flat cleaning fee (per case) for all glasses. We also offer rental services for linens. A deposit is required per case which is reimbursed upon return. 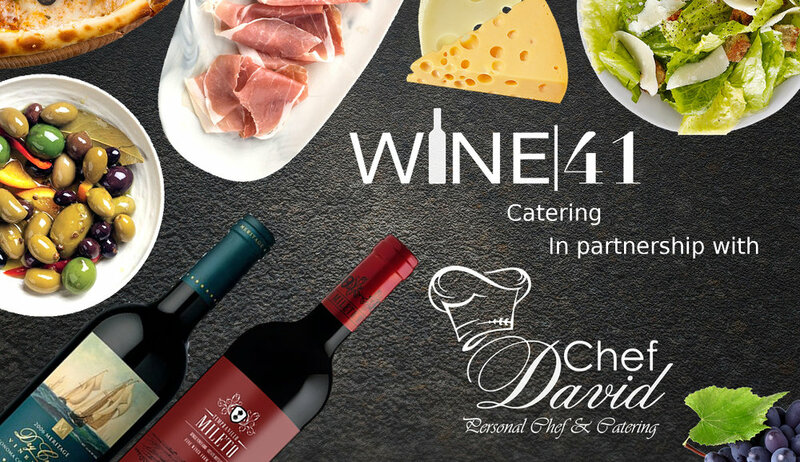 Wine41 is available to deliver and pick up your catering order to and from your home or event venue. Our friendly staff is available to serve and bartend at your next event. Wine41 provides a full wine bar inclusive of professional staff. For over 10 years, Chef David and his highly trained staff have catered parties large and small to fit every budget and palate. Chef David make each dish fresh to order using only the highest quality ingredients to pair our very selected wines.